When it comes to sediment transport, Know Your Options! Each project has unique challenges and Brennan will design and implement a transport system that will deliver both efficiency and value. Consideration on whether transport hydraulically, by barge, or a combination is crucial to maximize production and reduce costs over the course of a project. One of the biggest advantages of hydraulic slurry transport is that it is very efficient. There are fewer moving parts in the system, eliminating the need to handle material multiple times. Contaminated sediment stays completely sealed from the outside environment throughout its journey from the dredge to the dewatering and disposal site. Brennan has successfully transported material over distances of 10 miles using a carefully orchestrated dredge plan and several boosters. Long-line transport such as this reduces the amount of equipment and personnel, and leads to significant cost reduction. Did you know that hydaulic transport can be implemented on a mechanical dredge project?! 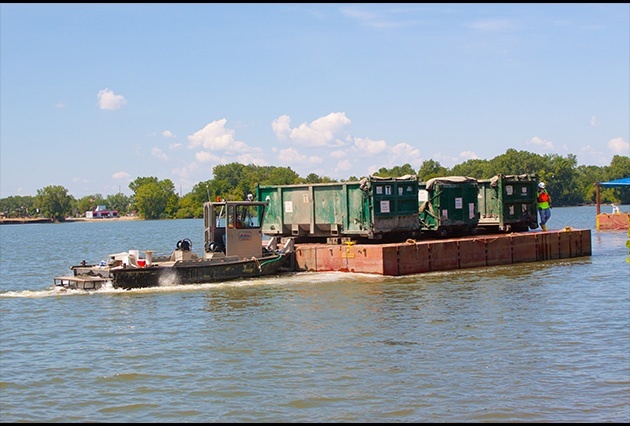 Brennan has a fleet of barges that can be used to move contaminated sediments. From roll-off containers on sectional barges, to hopper barges, or even traditional material barges, we can develop and implement a flexible approach to transporting sediment safely and efficiently. As a firm that specializes in water-based remediation, we use full-time licensed pilots and U.S. Coast Guard inspected vessels to move barges of all sizes when applicable. Did you know that barge transport can be implemented on a hydraulic dredge project?! Why not mechanically dredge and hydraulically transport, hydraulically dredge and mechanically transport, or both? It doesn’t always have to be one method or the other, and depending on the type of material being dredged there could be some tremendous cost saving options to consider! Brennan has developed a reputation for providing efficient transport using innovative methods and processes. Our ability to rapidly dewater or slurry sediment as it is dredged allows for creative options to increase efficiency and production. J.F. Brennan Company specializes in water-based remediation and habitat restoration projects throughout the United States. We have successfully completed some of the most challenging environmental dredging and restoration projects to date. 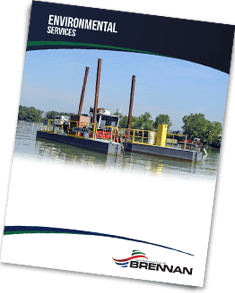 Download our brochure here to learn more about our hydraulic dredging capabilities and other services that we offer. Want more information on Material Transportation? Fill out the form below!